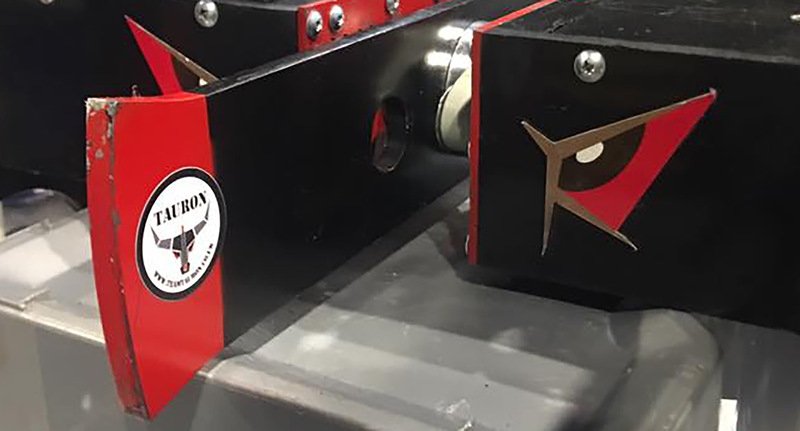 Straddle is Tom's first featherweight robot and is a bar spinner, using a smaller version of Tauron's bar. Team Tauron certainly didn't take the easy route by starting with a heavyweight; more sensible teams start with something smaller instead, such as featherweights. Featherweight combat robots weigh up to 13.6kg (30lb in the US) and are a great way to get into combat robotics. They're usually a lot cheaper to build than the heavyweights you see on Robot Wars, and also far easier to transport to competitions - Straddle's big as featherweights go, but even he fits in the boot of a car. 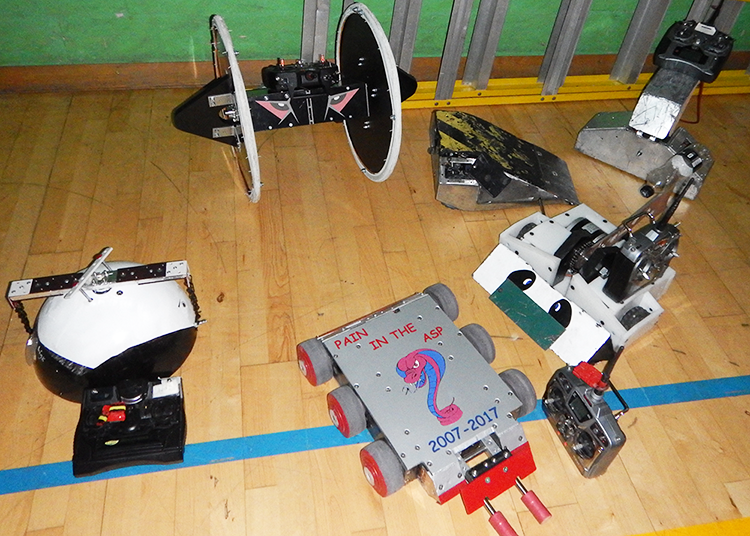 Many of the top robot teams build featherweights and use them to practice driving and building skills, try out new ideas before scaling them up, or just for fun. So at featherweight competitions there's a really good mix of experienced teams and newbies, and there's always someone to give advice if you need it. 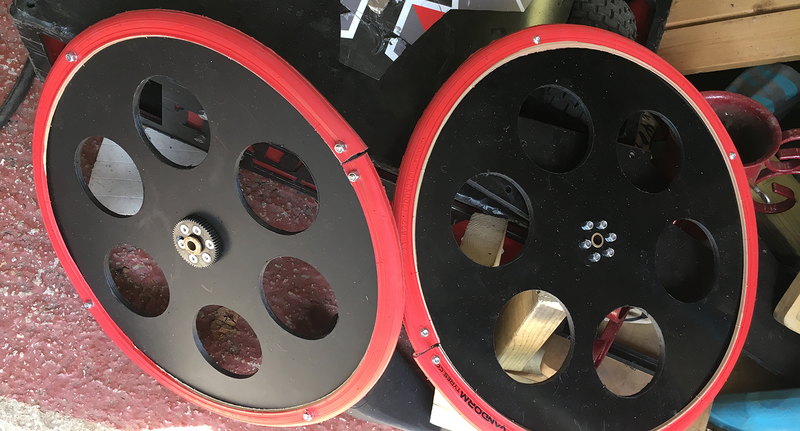 There's currently nowhere in the UK to use heavyweight spinners outside the Robot Wars arena, but there are more opportunities for featherweight spinners. If you do have a go at building a featherweight though, please remember that even though they're small, they're still powerful, potentially dangerous machines. If, like most of us, you don't have a spare arena to hand, test them with extreme care - there's a lot of advice and examples of good (and bad) practice online. If you watch Team Saint's Gabriel in the arena, you can see how hard it is for other robots to cause it any damage. It flexes when hit, and bounces around quite easily when flipped, and its motor section is out of reach of many robots and their weapons. Many featherweights are very compact and low to the ground, so Tom thought a featherweight using similar construction materials and keeping everything except the weapon high up could be successful. Of course, being Tom it would have to be an oversized bar spinner. The vertical spinner/Gabriel hybrid concept has also been tried by a robot from the USA; Huge. Gabriel had been the initial inspiration, however Tom had already started building Straddle when he found videos of Huge in action! So then Huge, along with Gabriel, became a source of further inspiration. A live event including featherweights was coming up in Guildford, so Tom got to work on a prototype. 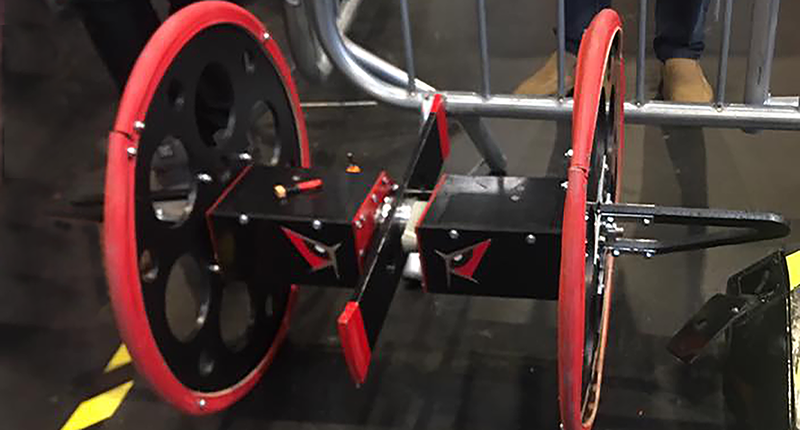 The main design challenge would be how to get the wheels moving and the bar spinning independently on a single axle, so at first he built a weaponless version to try out the basic construction method, and see how it drove and how robust it was. The prototype, initially called Spectre, took part in a couple of melees at the Guildford event and also had a test drive outside the venue. This proved that Straddle was very easy to drive (at least with no spinning bar in place) and bounced around quite nicely. It did have a serious tendency to get stuck on its side, but it certainly looked completely different to anything else out there! As you can see, Gabriel was also at the same event so the two robots posed for a photo op (who needs a banana for scale when you have Gabriel available?). Whilst it worked for the event, Straddle was completely rebuilt after the Guildford trial run. 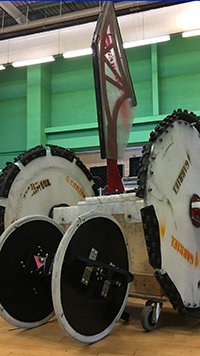 Tom redesigned the pods to make the batteries more easily accessible and the twin gearboxes more stable, and he also designed a custom axle to take the HDPE wheels and Hardox bar. How to connect the two halves together, whilst still having the weapon spin in the centre was a challenge in itself. The two halves of the robot were connected via a hollow weapon shaft - The weapon could spin on the shaft, whilst wires could still pass through it from one side of the bot to the other. Making the outriggers on the wheels asymetric meant that Straddle shouldn't get stranded on his side any more. 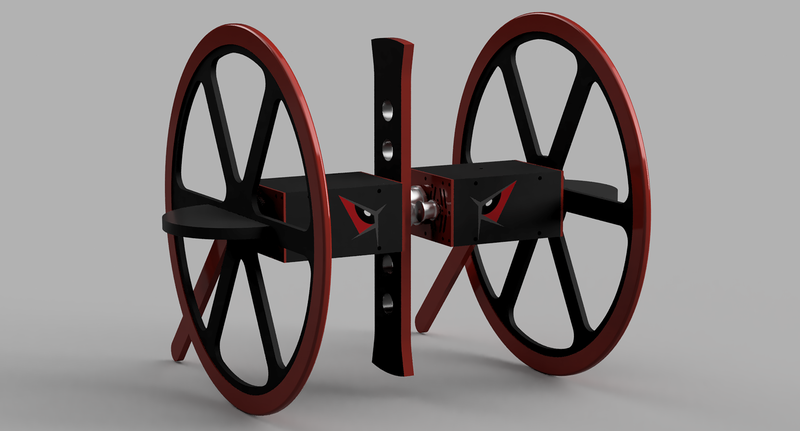 With some new red tyres and a few extra holes in the wheels to get within the weight limit, Straddle was almost ready. A full spin up and drive test (in a secure location) was very successful. Straddle was really manoeuvrable, even with the bar spinning at top speed. It was time for Straddle to get in the arena and fight. First weapon spin-up test, safely clamped down and filmed remotely. The GoPro was on a tripod and we were 50m away behind a wall for safety!